In early 2013, when former President Goodluck Jonathan caved in to pressure by the vociferous groups of civil society and ethno-cultural groups to organise a national conference that would address the “national question”, correct the imbalances and usher in a brand new Nigeria, I knew that, once again, the country had begun another wild goose chase that was going to lead nowhere. Indeed, as the conference was being put together, I had a sense of déjà vu and a feeling that deliberations from the conference were going to end up in the dusty shelves of our archives. This was not a case of the sincerity of the convener. Beyond the matters of sincerity, the intent and framework guiding the proposed conference were flawed from the outset. My conclusion about Jonathan’s motive was that the former President must have thought that convening a conference had been the usual thing to do by all presidents that had ruled Nigeria. Even though the proponents of the conference and Jonathan’s sympathisers had made the conference look like the final solution to our country’s national questions, it was glaring to discerning Nigerians that his capitulation to assemble prominent Nigerians from all walks of life to deliberate on Nigeria’s future was not borne out of any conviction to truly restructure the country. Incredibly, some Nigerians still believe that a conference whose aims had been defeated right from the inaugural speech of the former President could still usher in a new Nigeria of our dream. Just like former President Olusegun Obasanjo’s political reforms conference, the Jonathan’s parley will soon be forgotten until another President decides to embark on another jamboree and the saga continues. Looking back in contemporary political history of our country, Jonathan was not the first president to have agreed to the idea of a national conference whose goal was to re-shape Nigeria’s structural challenges. The demand for a true fiscal federalism has been a war cry by the minority groups that make up the federation. Some have even advocated that we return to the regional structure of the post-Independence era. What had become a familiar but depressing scenario, about past conferences, was that after months of deliberations, the reports were sent to the archives while future governments would waste taxpayers money on organising another. In the process, huge taxpayers’ money is wasted in organising a talk show. Why anyone would expect an incumbent centrist president to implement decisions he did not help put in place is what has made those clamouring for the implementation of past conferences ignorant of presidential politics in Nigeria. First, Jonathan was never going to rock the boat of the illusion of a one indivisible Nigeria he inherited from the powerful political blocs that propped him up as President. He had to toe the line. A national conference was a good distraction. Bringing Nigerians together to discuss had announced him into the pantheons of presidential gods who had also done the same without being necessarily convinced it was the right to do to put Nigeria on the path of greatness. 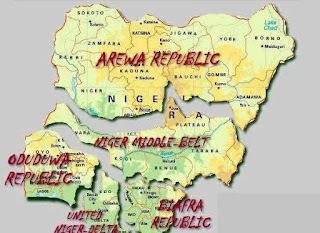 In any case, it would have been an irony that a minority Niger Delta whose stock had suffered years of degradation and exploitation by the powerful Nigerian state would not readily accede to the dismantling of the status quo. But Jonathan was either not convinced or was too spineless to cause an epoch making shakedown in the way the country is run and structured. A better explanation would be that unlike Obasanjo who we all know to be an unrepentant nationalist of the dying but still powerful generation of Nigerians, Jonathan seemed not to understand the symbolism of his Presidency to alter the course of history. He maintained the status quo. Long before the modalities for the implementation of the conference decisions became another media debate, the former President’s speech at the conference had convinced me that the confab was going to end up like the ones before it. I knew there and then that we had begun another fruitless search into Nigeria’s future. In his speech, Jonathan had maintained that “the indissolubility and indivisibility” of Nigeria was not negotiable and must not be discussed. What that meant was the delegates could discuss everything but the restructuring of Nigeria. Yet, those who had called for a national conference had made restructuring of Nigeria the centre of their agitation. Do not get me wrong. This piece is not about the last national conference. My worry is ours is a nation that suffers from collective amnesia and has always failed to learn from history. During the eight years of Obasanjo, the question of a national conference also dominated political discussion. In February 2005, Obasanjo suddenly convened what he called the National Political Reform Conference, comprising a motley of persons handpicked by himself and the state governors as well some members of certain ethnic groups and other associations –a completely undemocratic body with no mandate from the people or from the ethnic nationalities and civil society organisations. There was no enabling law establishing it and backing up its work. The role of the Obasanjo conference as announced by the then Attorney-General of the Federation, Chief Akinlolu Olujinmi, was only to make “recommendations which the National Assembly and the Presidency will look into and see how to integrate these views into our constitution.” In other words, the conference was simply part of a process of consultations to aid the Presidency and the National Assembly in the discharge of their functions with respect to the amendment of the Constitution. The NPRC thus differed totally in nature and character from the proposed National Conference. The NPRC was dogged by crisis and, after some months of deliberations, ended abruptly in confusion. Its failure is, to some extent, a product of defects in its character and structure just like many conferences before it. It was, in the apt characterisation of it by the print media, a mere talk-shop lacking power to take legally binding decisions, which made the entire exercise a farce, a charade. That it is why it beggars belief that Nigerians continue to demand the implementation of a conference report that will never get implemented by the incumbent president. What I think should dominate national discussion is how our country can truly have a genuine people-oriented conference that will be subjected to a referendum. The Brexit referendum should guide future agitations for a Nigerian version. We cannot expect the Nigerian establishment that is represented by the powerful Presidency to initiate a true conference that will lead to a genuine restructuring of Nigeria along the lines of equity and justice.